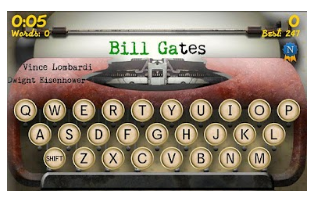 Considering the need to practice keyboarding on your iPad or Android Tablet? Following an earlier comment asking about the possibilities of iPad keyboarding practice apps and considering the needs of a student who will be producing word processing on his iPad during his school day, I started researching what was available in keyboarding lessons for mobile devices. No matter what device you are using there is a developmental sequence for the acquisition of keyboarding skills for communication. Next stage involves developing touch typing skills with individual key strokes learned to develop good technique along with ergonomic positioning when sitting at the computer (3-5 grade). The third stage involved developing speed and accuracy that is build upon good positioning and application of proper keyboarding technique (6 + grade). Different school districts differ on their grade level expectations of keyboarding and exceptions to instruction and acquisition of keyboarding is depending on student skills, type of instruction provided and frequency of application of the skills. School curriculum, age, skills and needs of the student should be considered when selecting the type of keyboarding program used and expectations (e.g. http://www.solon.k12.ia.us/district/instruction/curriculum/documents/keyboarding_curriculum.pdf ). Jalapeno app – (2.99) for iPad. 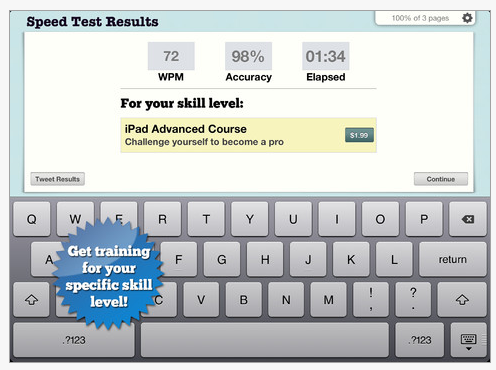 helps people of all ages learn to type with speed and accuracy. Typing Tutor Typing Droid – (Free)Android typing game to practice speed and accuracy. Does not provide introductory keyboarding instruction. Good for reinforcement after keyboard keys are learned. 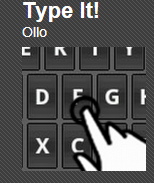 This game app does not provide basic keyboarding introduction of home row keys. Nice graphics and interface. Requires prior instruction to learn keyboarding technique. Good for reinforcement of skill and speed. Type It! App (free) – For Android, has setting to manage sound, volume of music presented in app. Game format keyboarding app practice. Does not appear to present keyboarding practice in a progress. Appropriate for increasing speed after keyboarding techniques have been learned. There are many keyboarding games and standard keyboarding lessons available online for students to practice and not be bored with the repetition needed to acquire keyboarding technique and accuracy. Many of those keyboarding game websites require flash player, not friendly (not available) on the iPad but which work well on the Android platform (allows Flash). http://www.typeonline.co.uk/lesson1.html – This website provides lessons in instruction of the keyboard in a progressive manner. Simple but well laid out keyboarding website. http://www.usspeller.com/keytutor.html – Online website for keyboard awareness does not use a standard keyboard instruction. Provides letter, word, then sentence practice. Works on with iPad with Wi-Fi connection. Here is an extensive listing of selected online keyboarding websites (Thank you to Mrs. Erin Higgins, COTA for this list) that will work on a standard computer or on an Android device. Again use of a standard keyboard, whether wired or bluetooth is recommended when initially learning the keyboard using a computer or mobile device. www.freetypinggame.net – Many different games with the ability to change the level of difficulty and how many rows (or keys) on the keyboard you want to focus on. http://freeonlinetypinggames.com/kids-typing/dino-kids-trash-typer/ – Falling words, one level of difficulty. http://funschool.kaboose.com/fun-blaster/games/game_super_hyper_spider_typer.html – Three levels of difficulty to choose from. Practice typing letters progressing to typing words. http://www.bigbrownbear.co.uk/keyboard/index.htm – Keyboarding instruction with the ability to choose the letters you want to learn. http://www.tvokids.com/games/keyboardclimber This site focuses on letter recognition on left and right sides of the keyboard. http://e-learningforkids.org/Courses/EN/K0001/index.html – Teaches 10 finger typing and providing students lots of feedback, visuals and good explanations. Offers lessons and games for them to practice the letters learned. http://games.sense-lang.org/ – This is a collection of games that range from typing single letters to words to copying full text. You can use Bluetooth keyboards as well as standard keyboards with your iPad. Bluetooth Keyboards – You can connect a Bluetooth keyboard by going to Settings > General > Bluetooth>On then slide button to ON. or iPad. Use of a stand (see some choices below) improves the ergonomic positioning a an important part of keyboarding practice. Standard wired keyboards – These can also be connected to your iPad using the Apple iPad Camera Connection Kit . The next challenge was positioning of my iPad in an upright position with the connector attached at the bottom. I unlocked the rotation on my device so that I could flip the iPad upside down and view the app with the connector positioned on top of my iPad. I could then position my iPad with my Targus Versavu Case that provides an easel in an upright position with the standard wired keyboard attached allowing the keyboard more appropriate ergonomic placement. suitable for easeling an iPad, Thrive or any other tablet for better ergonomic positioning. There many more choices of online keyboarding programs available for individuals to practice keyboarding without becoming bored. Ergonomics and set up generally will be better if you review how and where you are sitting and follow basic ergonomic principles. Beginning keyboarding lesson app are few. 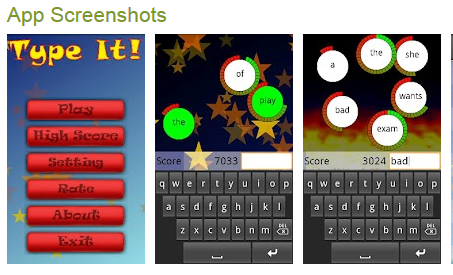 There are more Android and iPad apps for speed and accuracy than the beginning foundational skills of keyboarding. (Although Jalapeno was my favorite of all the apps and had good stage two lessons in it. There is merit, I believe, in practicing keyboarding with the layout of a keyboard associated with a mobile device you will be using as your primary mode of typing to gain speed and accuracy. It always takes a bit to become accustomed to a new keyboard. Always consider good ergonomic positioning, develop good typing techniques when word processing to establish good life time habits! For more information on ergonomics with your iPad visit the prior post on Ergonomics for your iPad! This entry was posted in Accessories, Android, App Reviews, Apps for OT's, Ergonomics, iPad, iPad Management, iPod/iPad Accessory, Keyboard, Occupational Therapy and tagged Android, App Review, iPad, iPad accessories, iPad apps, Keyboarding, occupational therapy, OT Apps. Bookmark the permalink. I am an OT, and I just found this great site. I look forward to further exploration. I’m also a relatively new Ipad user, and I’m wondering about the differences in techniques used to type directly on an ipad vs. a standard keyboard. I’m a relatively good touch typist using a standard keyboard, but more of a two/four finger typist on the ipad. 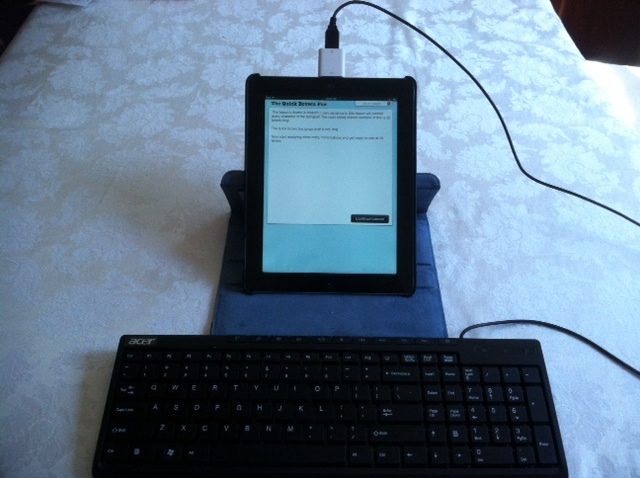 I wonder how switching back and forth between a standard keyboard and the ipad (or android) will affect our students. With a standard keyboard, one tries to keep ones fingers resting on the home row keys–but this is not possible with the ipad. Thank you for visiting! Those are all good questions which I am not sure if there is an answer. One consideration is the age of the student using it, have they had keyboarding instruction, are working on keyboarding instruction and what is the task that they have to do with the iPad? If it is a student that the goal is to increase their speed, I would give them a standard keyboard to work on – attach one, use blue tooth, etc but try to require them to keep working on good keyboarding technique then speed and accuracy. Some students you just want them to have a keyboarding rate commensurate to their handwriting speed so they are not frustrated with word processing and continue to work on keyboarding technique to improve their ability to get information down. 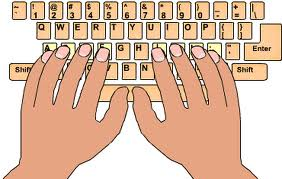 Younger children I beleive need to work on keyboarding awareness, our philosophy has been to start kids with awareness with a two handed approach and thumb use on the space bar and fingers curved over keys. We then move them to work on touch typing using different software pending age, ability and need. Some students due to severe handwriting – graphomotor challenges you just want to get information down on paper that is legible and word processing is a way to do that. So it all depends what the need and goal is, I believe, for the student. A OT I talked with this past spring accomplished touch typing with a 1st grader who was focused – and they both must have been determined (hats off to the OT and student!!). As for keyboards as mentioned in the post there are Bluetooth keyboards that will work with the iPad – you don’t typically need just a iPad compatible one if it is Bluetooth. There are also some keyboards that fit right over the top of the iPad that will give the feel of keys – iKeyboard is one or the TouchFire keyboard should be out any day, a slim magnetic keyboard that can be attached directly on your iPad in landscape (about 35.00). A search will give you more information if that might be a solution. The other fact is that most of our kids, at least at the middle school and above are switching back and forth with keyboarding – smart phones, regular phones by texting. I do believe that for now, standard 10 finger typing or learning one method and gaining proficiency, accuracy and speed are what is desired. Repetition and consistency does that so the standard method of typing still is the method to use, for now at least I believe. Carol, thanks for your thoughtful response. I am aware of bluetooth enabled keboards, in fact I have one for my ipad. I was just sort of thinking outload about the differences in typing technique between a standard keyboard (whether used with an ipad or laptop/pc) and a device that has a touch screen. Lynn, There is a definite difference in feel of touch screen versus a physical keyboard and to me the size of the iPad keyboards, with exception of the full sized ones are difficult to get used to as they are fit in a much smaller space. It is amazing how we do adapt from one to the other over time. It probably will take kids less time to adapt from one to the other. It will be interesting to see how keyboarding instruction changes in the next few years and whether keyboarding standards will change in time. Many things changing, quickly! Thanks again for visiting an sharing your thoughts! Great post! Thx for the info! Carol, As always thanks for joining and commenting on the blog!! Great post! One other site that is iPad compatible is http://www.typingweb.com. They just added iPad support last month and i believe an app is in the works. They recommend using the bluetooth keyboard for true touch typing practice, not only because you cannot feel the keys on the on-screen keyboard, but also because it does not include a semi-colon which is the key in the Home Row where your right pinkie lies (on a standard QWERTY keyboard). Thank you for the resource and suggestions! I am such a fan of your tech blog! I really enjoy your ideas and resources! I am on your reader list and will stay tuned to your info!